刘琳娟, 陆亮. 甲基汞在鲳鱼中的积累规律初探[J]. 环境监控与预警, 2019, 11(2): 38-40, 53. LIU Lin-juan, LU Liang. Study on the Accumulation of Methylmercury in Pomfret[J]. Environmental Monitoring and Forewarning, 2019, 11(2): 38-40, 53. Abstract: A method for the determination of methylmercury in pomfret by Gas Chromatography-Cold Atomic Fluorescence Spectrometry was established. The enrichment rule of methylmercury in pomfret was preliminarily deduced by comparing the contents of methylmercury in the flesh, skin, gill and viscera of common pomfret in Nantong sea area. The results showed that the calibration curve of methylmercury in the range of 0~1 000 pg was y=567.354 3x-545.733 8, r≥0.999 9, and the detection limit was 0.03 ng/kg. 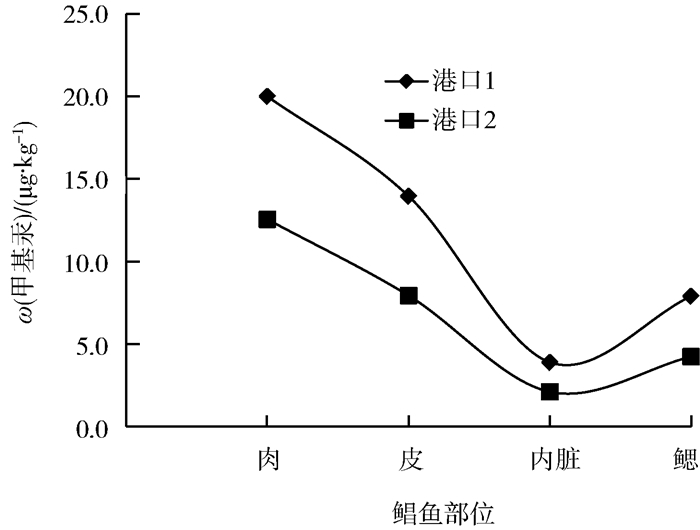 The mass fraction of methylmercury in all parts of pomfret was 2.11~20 μg/kg, RSDs were less than 5.0%, and the recovery rate were in the range of 74.6%~81.0%. The distribution pattern was flesh > skin > gill > viscera. The method is simple, accurate and suitable for the determination of methylmercury in pomfret. 陈霄, 张文凤, 黄伟雄, 等. 广东沿海两地海水鱼总汞与甲基汞的相关性分析[J]. 现代食品科技, 2018, 34(7): 1-8. 秦英, 王建跃, 王恒, 等. 高效液相色谱-原子荧光联用法快速测定海产品中汞形态[J]. 中国卫生检验杂志, 2018, 26(6): 789-791. 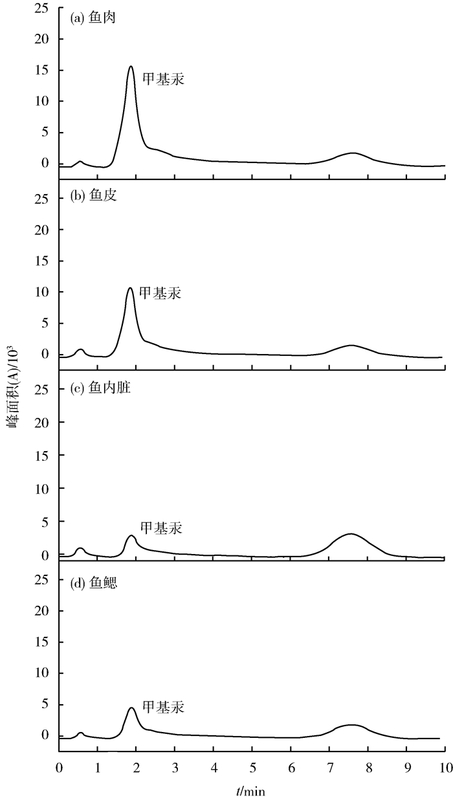 PUK R, WEBER J H. Determination od mercury(Ⅱ), monomethylmercury cation, dimethylmercury and diethylmercury by hydride generaion, cryogenic trapping and atomic absorption spectrometric detection[J]. Analytica Chimica Acta, 1994, 292(1): 175-183. 祁辉, 刘爱民, 黄业茹, 等. 巯基棉富集-毛细柱气相色谱法测定环境水中的甲基汞[J]. 中国环境监测, 2018, 26(4): 33-36. 林芳, 陆梅, 王芳. 气相色谱法测定地表水中的甲基汞[J]. 环境科技, 2010(S2): 78-79, 92. 何洁玲, 连海天, 邓建, 等. 全自动烷基汞分析仪测定鱼肉中甲基汞含量[J]. 食品工业, 2018, 39(8): 316-318. EPA.Metuylmercury in water by distillation, aqueous ethylation, purge and trap, and CVAFS: EPA Method 1630 [S].2001. 修瑞琴, 高世荣, 霍本兴, 等. 甲基汞在非洲鲫鱼体内富集作用的研究[J]. 环境科学, 1980, 1(19): 77-79. 曹艳, 罗文华. 汞、砷对水生生物的危害与调节措施[J]. 黑龙江水产, 2013(5): 30-32. 蔺玉华, 张冰艳, 卢健民. 鱼体汞的甲基化及其甲基汞的吸收与代谢[J]. 水产学报, 1994, 18(4): 326-329. 环境监控与预警, 2019, 11(2): 38-40, 53. Environmental Monitoring and Forewarning, 2019, 11(2): 38-40, 53.